Made with durable synthetic leather, this high-performance glove offers a snug fit and extra hand protection. Padded knuckle protection and Spandex stretch panels are for ventilation and better comfort. Adjustable hook and loop wrist ensures a snug fit. A two-tone PVC palm gives this hardworking, high-performance synthetic glove a tough grip. It's comfortable, with heavy-duty Spandex ventilated stretch panels between fingers. Easy to put on and take off with ergonomic pull tab. Use the terrycloth panel to wipe away sweat. Adjustable hook and loop wrist ensures a snug fit. Count on a perfect fit with reliable protection every time. These High Performance Utility Gloves are breathable with 4-way stretch material to deliver a perfectly snug fit all day long. The synthetic leather palm means these gloves will last. Padded knuckles will keep your hands protected for the long haul. Firm Grip Nitrile Coated Gloves 12 Pair - Buy 10 Pairs, Get 2 FREE! Firm Grip 12 pack nitrile coated gloves are great for multiple tasks. The breathable material on the back of the glove keeps hands cool while the dip keeps hands protected. These gloves are great for those with latex allergies. The knit wrist keeps dirt and debris out of the gloves while working. 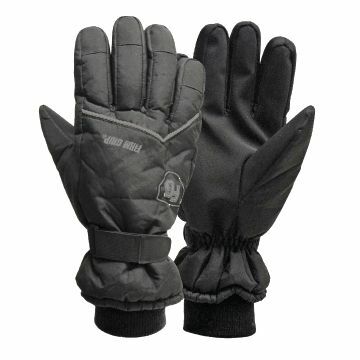 SB Black Ski Glove Xlarge is rated 2.0 out of 5 by 1. Rated 2 out of 5 by Peej from Get what you pay for When you are desperate for a pair of gloves and you have limited options. Great as a spare to keep in your car or toolbox. Relatively warm but materials are cheap as is construction. For double the price, you can find gloves that will last 5 times longer. Mine ripped on first wearing but I sewed them back.